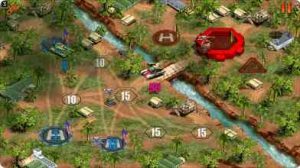 Gaijin Entertainment presents the sequel to the popular tactical strategy game, which has won the devotion and recognition of many players worldwide. The Modern Conflict 2 project will provide you with new battles, more gameplay, and multiplayer mode, the most interesting feature! World powers will face each other in a desperate fight for global superiority and will transform the entire planet into an actual battleground. Be ready to develop batteries of artillery in the Gobi desert, to construct air facilities on glaciers and hide your tanks in the rainforests of Amazonia. But the enemy will also be cunning, after all, since now you have the ability to battle with a general whose skills are no worse than yours. You can do it in the the fully-featured multiplayer mode! Over 100 achievements, as well as leaderboards on the GameCenter network service.